The Tennessean honored Cori's with not one but TWO hot dogs on the 5 Best Hot Dogs in Nashville article. While we can't pick favorites (they are all like our children) - we have to say they chose a couple of pretty great 'dogs for the list. 2015 Tennessean Toast of Music City Award Winner! We were honored to find out that you, our great customers voted Cori's DogHouse the Best Restaurant in Wilson County for the 2015 Tennessean Toast Of Music City Awards. We are beyond thankful to all that voted and will continue to strive to make the best food for you and provide a place that you and your family will enjoy. We had the pleasure of having Sarah, Amber and the crew from More At Midday from Channel 4 News WSMV come over to our Nashville/West End location and film a feature on Cori's, hot dogs and Sully. It was an honor to be featured and we hope that everyone enjoys watching it as had making it. Cori's DogHouse in BEST IN CHOW! Back in July Cris Nannarone and the crew from The Cooking Channels Best In Chow came to Nashville to pit 3 local hot dog restaurants against each other. The filming was a great experience and we are looking forward to the show airing starting October, 2014. The folks over at the Nashville Scene have a great article on all of the show on The Cooking Channel that will feature Nashville restaurants and chefs over the next few months. Be on the look out for the episode of Best In Chow - Hot Dog Wars Nashville featuring Cori's, I Dream Of Weenie and The Dog starting Wednesday, October 15th at 10pm Eastern. 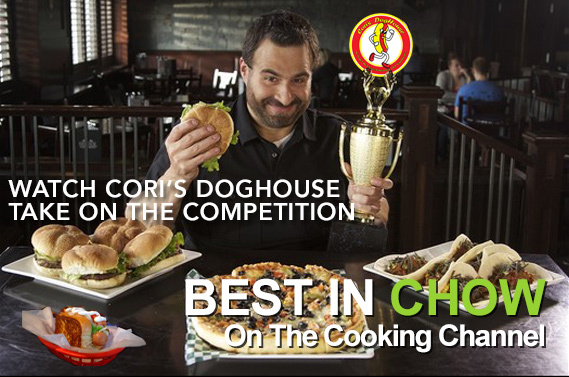 Cori's DogHouse is Nashville's premier hot dog restaurant with locations off West End and in the Providence Mall in Mt. Juliet. 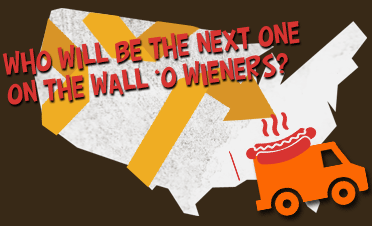 Featuring 38 different hot dog variations, sausages and sandwiches, and the best fried pickles in Tennessee.